Following its cinema release, the general feeling was that Christopher Nolan’s ‘Interstellar’ had been something of a disappointment. Critics certainly had some considerable praise for it, but audiences generally seemed to be a tad confused or cold towards it. But is that a problem with the film itself, or a problem with our expectations of it? With its release on Blu-ray, perhaps it's time to give it a reassessment of Nolan’s film. Perhaps it isn’t the minor film we thought, but one of his finest to date? Rather than being the complex epic we’d come to expect from the director of ‘Memento’, ‘Inception’ and The Dark Knight Trilogy, ‘Interstellar’ is a far more simple, straightforward affair, albeit one dealing with the most complex of speculative sciences. On a macro level, it’s the story of a mission to find the human race another home as the earth slowly dies. On a micro level though, and the level that appears the more important to Nolan, it’s the story of Cooper (Matthew McConaughey), an astronaut on the scout mission to find that new home, and his relationship with his daughter Murph (Mackenzie Foy and later Jessica Chastain), left behind on the dying earth. Where Nolan’s previous films have been brooding and dark, ‘Interstellar’ is an unexpectedly beautiful and sentimental film, elegiac in its execution and unapologetic in its emotions. This may go some way to explaining why it was seen as a disappointment to some audiences - it simply wasn’t the sound and fury we were expecting from the man who reinvented the superhero genre. ‘Interstellar’ is science fiction in the tradition of Steven Spielberg and Philip Kaufman, far more concerned with the human drama rather than spectacle. By focusing on the father-daughter relationship, Nolan and co-writer Jonathan Nolan give us a human angle by which to access and comprehend the enormous ideas they’re playing with. Nolan’s usual technical mastery is there, but there’s a passion to ‘Interstellar’ we haven’t seen before, a warmth we probably didn’t know he had, which makes this feel like his most personal film so far. There are moments in the film that rank amongst his most powerful, thanks in no small part to the beautiful performance by Matthew McConaughey. Unlike most of Nolan’s protagonists, Cooper is a man so desperately trying to live and to preserve the possibility of life in the face of a disappearing hope. At its best, ‘Interstellar’ works when it plays with that tension between hope and despair, the hope driving those in space through a wormhole into an alternate universe to find a new home, and the growing despair of those left behind waiting. This feels like new territory for Nolan, this level of intimacy, and hopefully this means a new era for him as a filmmaker. That said, while it might be his most intimate epic, it’s still an epic. The visual scope of ‘Interstellar’ is at times staggering, and it's thanks to Nolan and his cinematographer Hoyte Van Hoytema that the epic not only applies to the jaw-dropping sequences in space but the dust-crippled earth. This still looks like a Nolan film - the careful, controlled framing, the startling detail, the visual sense that’s more cinematic than most of his contemporaries, but the emotional content pushes him into new directions so that ‘Interstellar’ feels far more fresh than, in hindsight, ‘Inception’ did when compared to his Dark Knight films. That extends into the stunning score from Hans Zimmer, a beautifully elegant and heartbreaking work, albeit one that doesn’t quite shake off its reliance on Philip Glass. So upon second viewing, what is there to make of ‘Interstellar’? When I first saw it at the cinema, I was incredibly impressed, but thought it was one of Nolan’s lesser works. Now, after revisiting it, I found myself far more emotionally involved and moved by it, taken up by its sweeping scope and invested in its characters. Instead, I’d say that ‘Interstellar’ is one of Christopher Nolan’s finest films, far more human and passionate than we’ve ever seen him. Of course it has flaws, but so do all his other films (yes, ‘The Dark Knight’ has flaws too). Coupled with Alfonso Cuaron’s masterpiece ‘Gravity’, we seem to be in an exciting new age for science fiction cinema, and I have no doubt that in years to come, ‘Interstellar’ will be seen as a true classic of the genre. I cannot wait to see where Christopher Nolan will take us next, and cannot wait to revisit this film for many years to come. ‘Interstellar’ is one of Christopher Nolan’s finest films, far more human and passionate than we’ve ever seen him. There’s a lot to talk about with the image and sound of ‘Interstellar’. Nolan shot the film on 35mm rather than digitally, and the 1080p transfer preserves the textures and details that come with that. What makes film far more exciting is the flaws inherent with it, and rather than eliminating them, Roadshow’s transfer maintains the grainy organic quality of the image, so that ‘Interstellar’ looks distinct from most other recent releases. Some might see it as a negative, but in my opinion, it just emphases the cinematic quality of the film, with no detail lost and glorious colours. The film was also shot in some sections in 65mm IMAX, so the 2.35:1 aspect ratio occasionally opens up to 1.85:1, opening up the image at the top and bottom. For the Blu-ray release, this has been preserved, but because Nolan uses this as a narrative tool rather than an aesthetic one, it never jars. In cinemas, the film also received a lot of criticism for what was seen as a flaw in its mixing, that the score and sound effects occasionally drowned out the dialogue to the point of it being incomprehensible. Nolan later stated that this was intentional, and the DTS-HD MA 5.1 track retains this artistic decision, one that I’ve never had a problem with. While a 7.1 or an Atmos track would have been better, this is still an enormous track, totally immersive with tremendous power. Most importably, it maintains the intentions of the filmmakers, and while this might not please some fans, it certainly made me very happy. Unlike most releases of Nolan’s films, ‘Interstellar’ comes with a surprisingly rich collection of special features, all included on the second disc. The first, a short documentary ‘The Science of Interstellar' (50:20), looks at the science behind the film, and how it directly influenced the creation of the film. The film itself is explored in a series of featurettes under the title ‘Inside Interstellar’. The fourteen short featurettes cover the design, development and making of the film, clocking in at over an hour and a half of material. All the key players are involved, offering candid and detailed insight into the filmmaking process. It would have been nice to have a Play All feature included though. The set is rounded off with a collection of theatrical trailers. The 'Interstellar' competition has now closed. Winners will be announced shortly. Competition opens at 5pm AEST on Sunday 5th April 2015 and closes at 11:59pm AEST on Sunday 12th April 2015. Five winners will be chosen at random on Monday 13th April 2015. To successfully win, entrants must fulfil the above entry conditions before the time the competition closes. Current members/followers are eligible to enter the competition. Only one entry per person. Only one winner per household. To be a valid winner, the entrant must not have won a prize from SWITCH within the last 28 days. 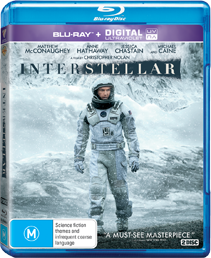 Each winner will receive one Ultraviolet Blu-ray copy of 'Interstellar'. By entering, you agree to receive occasional emails from SWITCH in the future. If you decide to unsubscribe from these updates, any further entries will not be applicable. Only Australian residents are eligible to enter. 'Interstellar' is available on Ultraviolet Blu-ray and Ultraviolet DVD on Wednesday the 8th April 2015 from Warner Bros. and Roadshow.